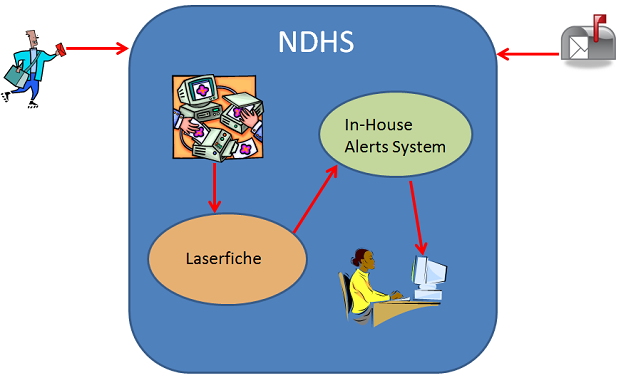 Our Department of Human Services – Benefits Division (NDHS) deals with a large number of documents on a daily basis relating to temporary assistance for needy families, foods stamps and several other public assistance programs. Due to the extreme amount of paperwork related to these cases, our scanning center used to have a four-to-five day backlog. With Laserfiche, we have completely eliminated the backlog and now maintain a one-day turnaround on cases. Here is how we did it. Case documentation arrives at our office in a few different ways, including the US Mail and in-person interviews. In addition to hard copies of documents, we also deal with some electronic documents such as searches from the State of Virginia’s Systems Partnering in a Demographic Repository (SPIDeR) and screenshots. Here is how we store all of these documents in our repository. 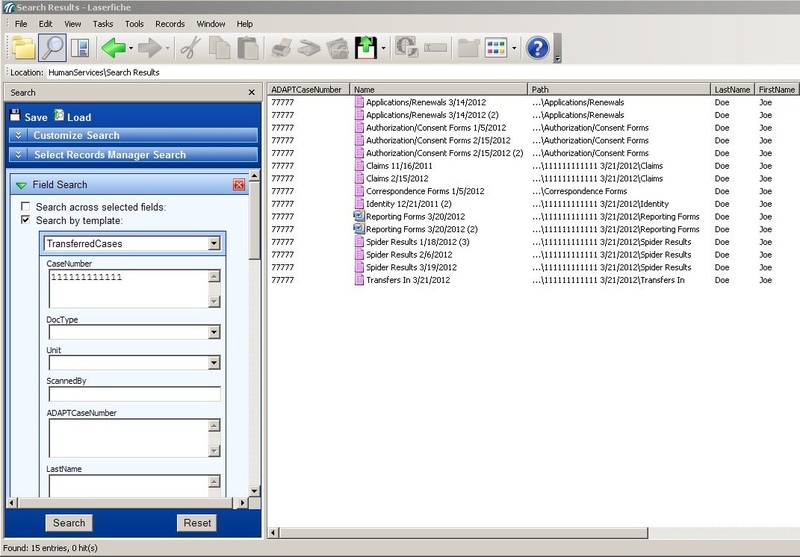 A large number of case documents are scanned directly into Laserfiche using Laserfiche Scanning. Certain employees, such as those dealing with clients who drop off documentation, have access to scanners directly and can scan documents themselves. During this scanning process, they enter certain vital metadata, such as the Case Number, manually into the Case Files template. The majority of employees do not have access to a scanner. 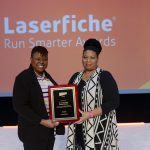 Because of this we have a dedicated scanning center with two and a half full-time employees responsible for scanning documents into Laserfiche. 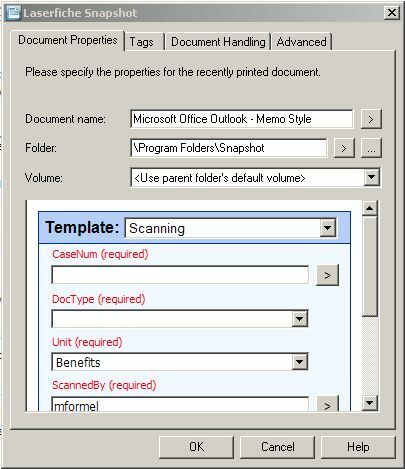 Before sending documents to the scanning center, employees must print out a cover sheet for each different case. They do this with an in-house interface that uses Laserfiche metadata to generate barcodes. After clicking Search, they will be presented with a list of cases that match their search parameters. Double-clicking on a case will bring up all of the associated metadata. Once employees have verified that this is the case that they need, they can print out a cover sheet. 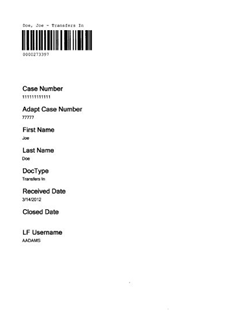 This cover sheet includes a barcode with the encoded Case Number and a list of other identifying metadata. The employee appends this coversheet to the case documentation and the entire packet is routed to the scanning center. 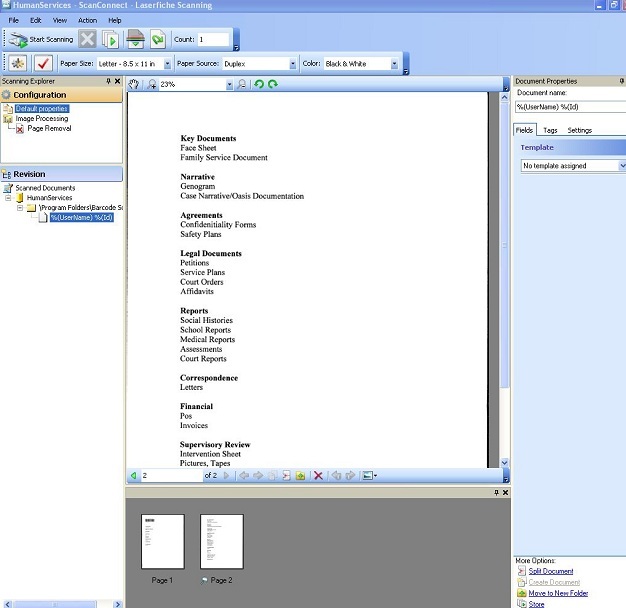 The scanner operators scan the case documents into the Barcode Scanning folder in Laserfiche and use the Page Removal process to remove the blank pages. Before storing the documents in the repository, they use the information on the cover sheet to populate the metadata. Whenever we have a new case, we must check if the individual exists in any of the myriad of state systems by searching in SPIDeR. SPIDeR was developed by the Virginia Department of Social Services to enable effective and efficient data sharing between government agencies at the state, local and federal levels. 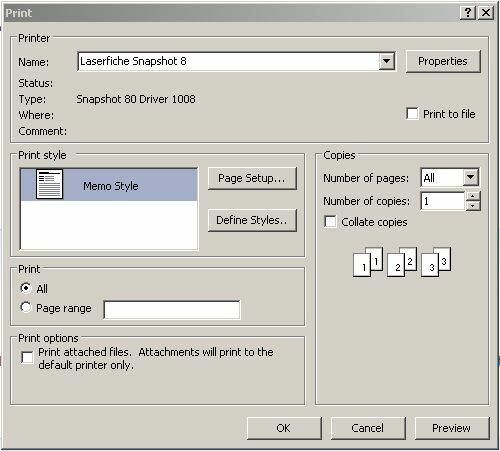 After employees generate a search in SPIDeR, they use Laserfiche Snapshot to print a copy of the results directly into Laserfiche. 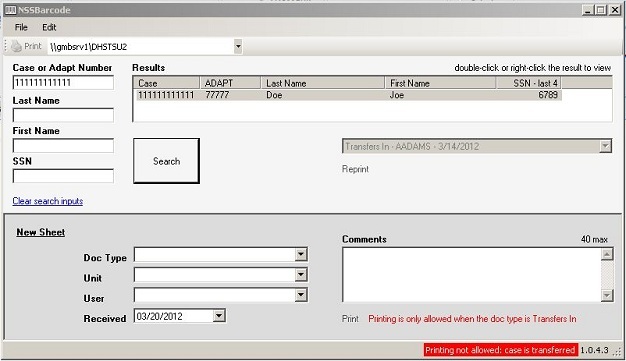 During the printing process, employees manually apply the metadata, such as the Case Number. In order to notify case workers of newly scanned documents pertaining to their cases, we utilize our In-House Alerts System. 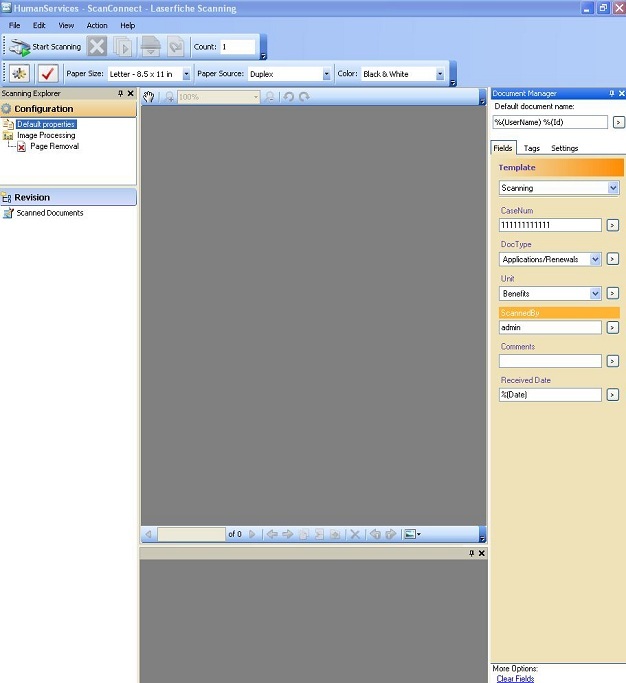 A SQL query runs hourly on the Laserfiche database to check for all newly scanned case documents. A COBOL program uses the query results to look up the Case Number in the database. It then determines the assigned case worker and e-mails that person an alert that there are new case documents for review. Here is a brief diagram of this process. Once the various case documents have been captured in Laserfiche, they need to be moved to the appropriate place in the repository. 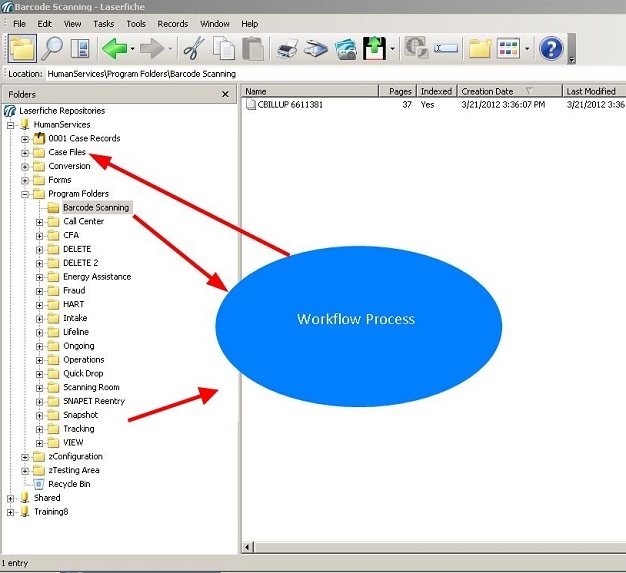 For this purpose we use Laserfiche Workflow. 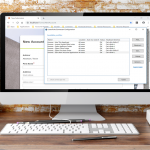 We have created different workflows to route documents from the various folders into which they have been scanned to the appropriate record folder for storage. Shortcuts to these documents are then saved in the appropriate subfolder within the Case Files folder. Records retention is described in more detail in the next section. 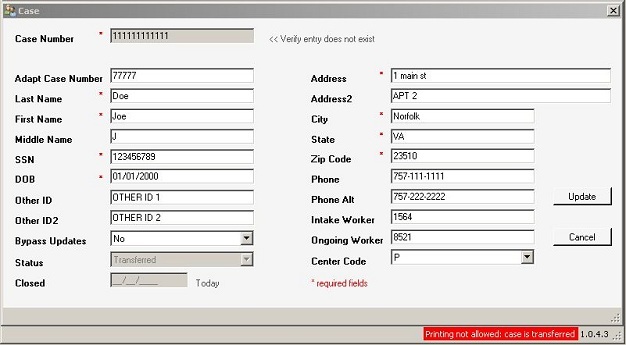 The workflow that deals with files in the Barcode Scanning folder, deletes the cover sheet before routing the documents. We have over 150,000 active cases on file. Each case has its own subfolder within the Case Files folder in the repository. It would take a very long time to browse through all of these folders to find the exact case that an employee is looking for. Since every document has a Case Number, the easiest way for employees to retrieve these documents is to search using the Field Search. They can search by any field in the Case Files template, not only the Case Number, such as Name or Social Security Number. 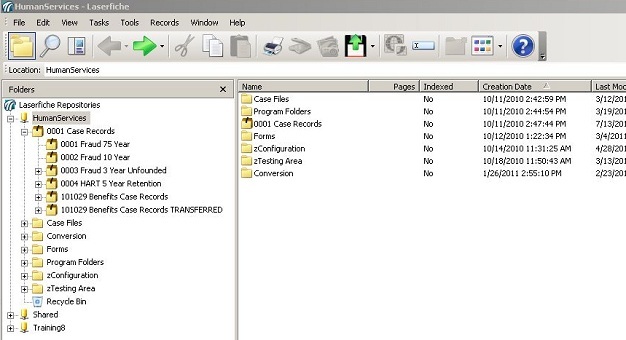 As soon as a case document is captured into Laserfiche, it is automatically saved in one of our record folders. There are instances when the case moves from Benefits to Fraud. When this happens, a shortcut to the record series in question is placed in the Fraud record folder so that the case exists in both places. Each record folder has a different retention schedule that is inherited by all of its subfolders. Retention is automatically applied based on the document type and business unit. In the example below, the documents are set to be destroyed three years after the case has closed. Laserfiche does not delete any documents, it just notifies an administrator of all the documents that are past their required lifespan. The administrator can then manually delete these documents from Laserfiche. This allows the administrator to have final say in what actually gets deleted.